Kentuckians heading to the polls this year to decide who will be their next governor will find a familiar name on the ballot. Matt Bevin, Sen. Mitch McConnell’s primary challenger last year, decided to launch a run for Kentucky Governor at the last minute. He got in just under the 4 PM deadline. Bevin could alter the four-man race for the governor’s mansion; incumbent Democratic Governor, Steve Beshear, is term-limited. As for the Democrats, Alison Lundergan Grimes decided she will seek re-election as Kentucky's Secretary of State, clearing the way for Attorney General Jack Conway to easily clinch the nomination. Rand Paul beat Conway in the 2010 Kentucky Senate race. With Bevin, Republicans now have a four-way race. State Agriculture Commissioner James Comer is the perceived front-runner, but he was already competing against wealthy Louisville businessman Hal Heiner and former Kentucky Supreme Court Justice Will Scott. And with Bevin, the GOP adds a candidate with a combative history—particularly in his nasty race against McConnell last year. And if the party is unable to prevent its primary season from becoming an all-out brawl, it risks losing the governor's mansion yet again: Republicans have long sought the Kentucky governorship—and thought they had opportunities to take it in recent races—but the state hasn't had a Republican governor since Ernie Fletcher was ousted after one term in 2007. And over the past 50 years, Republicans have held the state's top spot for only eight. Bevin is most likely to upset the game plan of Comer, who so far has out-organized and out-polled his opponents. Comer has worked for months to consolidate support from tea-party types—and those efforts were met with early success. He posted the strongest fourth-quarter fundraising numbers of any of his rivals at the end of 2014, and he has been racking up endorsements from figures, including Rep. Thomas Massie and former GOP Sen. Jim Bunning. 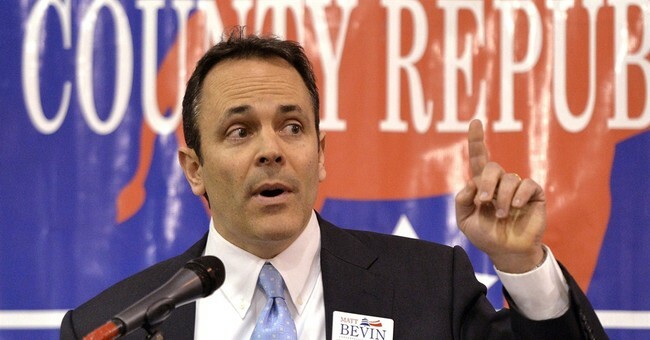 But Bevin is a state tea-party champion, and he threatens to take some of that support back. Comer is also aiming to play up his rural roots and contrast that with the urban profiles of Heiner—a former Louisville metro councilman and onetime mayoral candidate—and the Democrats' Conway, another Louisville native. "Comer's going nuts because he does not want Bevin in this race," said former state Democratic Party Chairman Danny Briscoe. "[Bevin's] a tea-party guy, probably the best-known tea-party person in Kentucky, and he's not from Louisville. His votes will be off of Comer's tally. That's someone who could have a real impact." The article also mentioned the state GOP’s frustration at being unable to capture the governor’s mansion, as their neighboring states become more Republican. It’s also the last Democratic bastion in terms of state legislatures; the State House is the only chamber Democrats control in the South. Sen. Rand Paul (R-Ky.) said that the Republican primary challenger to fellow Kentucky Sen. Mitch McConnell had his credibility hurt last week, when it was revealed that he had signed a letter showing support for the financial bailout program. McConnell in Kentucky, as quoted by the Associated Press. "So the fact that at one point he said he was for TARP but now he's against TARP, it does hurt credibility." Bevin, the former president of an investment firm called Veracity Funds, signed an October 2008 report to investors that heaped praise on TARP as one of the bright spots in the economy. The report said to not "call [TARP] a bailout." Bevin has built much of his campaign on attacking McConnell and the "establishment" GOP on bailouts. His rhetoric has now been called into question by many Republicans as to whether it was genuine. Bevin went on to lose the primary by nearly 20 points.